A ‘repechage’ is defined as a trial heat that gives first-round losers a last-ditch opportunity to qualify. The word comes from the French term for ‘second chance’ – and a second chance is just what Ian Williams (GBR) needed to get back in the game, and into the line-up for a chance to win the 2015 Congressional Cup. 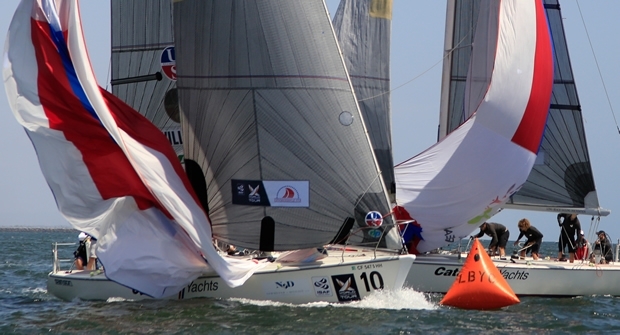 Williams, the current ISAF Match Racing World Champion and two-time Congressional Cup winner, found himself uncharacteristically in the bottom half of the pack after three days of Qualifying in Congressional Cup racing. While the top six contenders – Taylor Canfield (ISV), Reuben Corbett (NZL), Phil Robertson (NZL), Joachim Aschenbrenner (DEN), Bjorn Hansen (SWE) and Chris Steele (NZL) – qualified automatically for the Quarter Finals, Williams was in a battle with Keith Swinton (AUS), Scott Dickson (USA), Przemysław Tarnacki (POL), Eric Monnin (SUI) and Dustin Durant (USA), for one of two remaining slots. But Williams used that second chance to fight back – and fight hard – winning the repechage 5-0 and a spot in the Quarter Finals. Now, after winning eight races in a row, he will compete in the Semi Finals Sunday 17th May, along with Canfield, Robertson and Hansen. Swinton was the eighth and final competitor to make it to the Quarter Finals. In that, first to three points competition, Canfield elected to race against Aschenbrenner, while Robertson chose Ficker Cup winner Steele, saying, "we won Ficker Cup last year and did terrible in the Congressional Cup, so maybe that’ll work in our favour.” Corbett chose Hansen, leaving Swinton and Williams to duke it out. Today’s breeze from the southeast started strong then shifted right during the day to put the start-finish line right beneath the noses of the hundreds of spectators enjoying the view from Belmont Veterans Memorial Pier. Racing was close, and aggressive, with several collisions and penalties a plenty, according to Chief Umpire Alfredo Ricci. In the end Canfield triumphed over Aschenbrenner 3-0, likewise Robertson went 3-0 over Steele. Swinton (0-3) fell to Williams, saying, "Ian gave us a bit of a schooling." But the contest between Corbett and Hansen went the full five matches, each with two wins before the final sudden death match in the late afternoon. Following the match was a Pro-Am fleet race back to Long Beach Yacht Club; the Congressional Cup Umpires finished a triumphant second (of nine). Hansen will be paired with Canfield, and Williams with Robertson, in the Semi Finals which begin on Sunday at 1130, beneath expected sunny skies and WSW winds of 10 knots, on the Congressional Cup Stadium course: a federally designated area of Long Beach’s outer harbour.